There are two ways to add users to your team. You can either invite them (with an e-mail address), or create them (without an e-mail). When you want your team members to have their own username and password (for example if they need to track time via the web, or on their mobile phone), you will need to invite them to the system on their e-mail address. 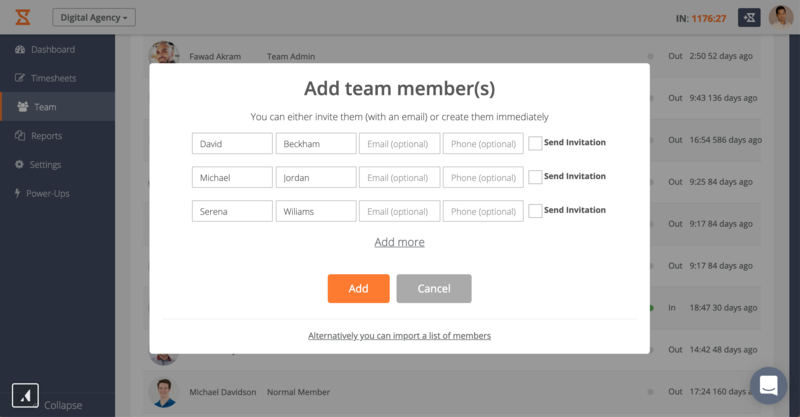 At the bottom click "Add Team Member"
Your team member will receive an e-mail with a signup link. When he/she signs up, the team members will automatically be added to your team list. You can invite your users through the invite command. Read more about that here. Besides access to Jibble in Slack, users will also get access to the web app. Read more about that here. If you only use the Jibble Attendance Kiosk, and you do not want your team members to login to the web app (and view their timesheets for example), you can create them without an e-mail address. The team members will be directly created in the list and can immediately be used in Jibble Kiosk Mode. Note: You can also import a large list of employees immediately with CSV file (with or without e-mails). Read more about that in this article.